When it comes to reliving this particular island wedding it is one I wish we could do over and over again. As a destination wedding photographer I am so lucky to travel to incredible countries all of the world to photograph the unique love stories that it’s made of, but this one really moved mountains. From the moment I saw Emma and Cameron together it was evident that their love was made up of something truly deep. After a few plane rides and a casual NZ stopover, I made it to the postcard perfect nation of the Cook Islands; the water was reflecting a crystal blue sky and each sandy front lined with tall green palms and coconuts to match; we were off to a glorious start! The Anchored Cinema crew and I couldn’t help ourselves but scout a little more around the island itself, so it was off on our scooters and on to an adventure. But the real adventure was that of Emma and Cam, a love that had begun through the core of their passion, travelling. While pouring a few pints or two on a European working trip, Emma had her eyes set on the man names Cam who frequented the venue for work (and possibly a few beverages too) After a few weeks of shy chatter, it was onto date one and then into a life together hand in hand. With their travel plans leading them to different parts of the world, Cameron knew he wanted his to be filled with Emma’s love; so after a day of cheese tasting their way through Amsterdam, Cameron asked Emma to be his one true love. It all become official at the Nautilus in the Cook Islands during the most beautiful beach ceremony surrounded by close family and friends who had travelled to be with themon such a special occasion (I bet it is one they are glad they didn’t miss!!!) 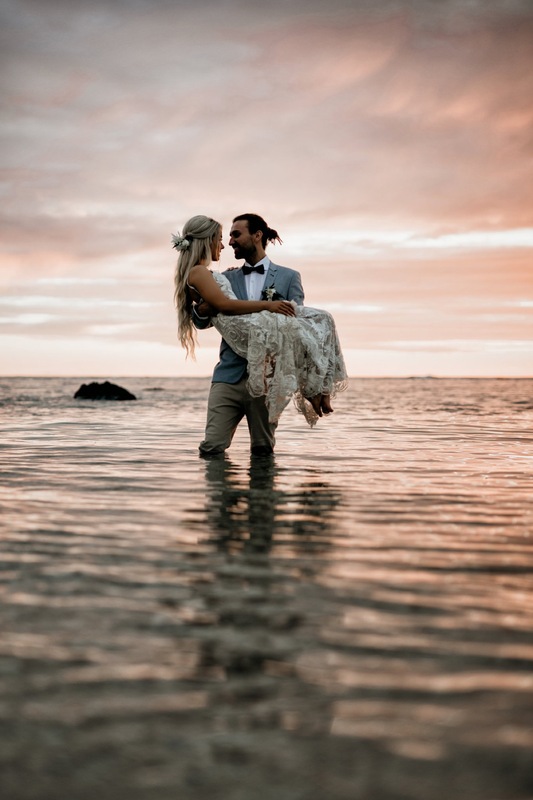 Once the formalities concluded we set out on a little journey around the island to capture light, love and those tiny pieces of perfection that Emma and Cam could now relive over and over. Sandy toes and loud cheers carried on well into the night as this love was celebrated in the ultimate island style. Emma and Cam spent a few more days enjoying the sand and champagne, then it was onto Tahiti to live up those honeymoon vibes; and me, it was home time – reliving their day over as the photographs unfolded – a destination wedding that ticked every box; new adventures, real love, countless stories and endless memories.